The Identi-Pen is two marking pens in one. The pens tips are made of a tough fiber for long life. One end of the pen has a fine pointed tip and the other end has an extra fine pointed tip. This permanent marker writes on metal, glass, fabric, photographs, plastics, Mylar, test tubes, wood and much more. The ink is permanent, waterproof, fade resistant, quick drying and does not bleed through most papers. The Identi-Pen can be used on non-porous surfaces as well as paper products. 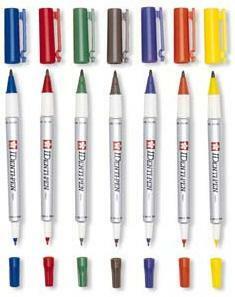 Identi-Pens are available individually in black, blue, red, green, and in a set of all 4 colors.